Google gives users a whopping 15 GB of free storage but if you’re a frequent Google Drive user and don’t do a good job of cleaning up your Gmail account, you could find yourself running out of space. One solution is to save messages as PDFs to file on your computer and delete the original message. 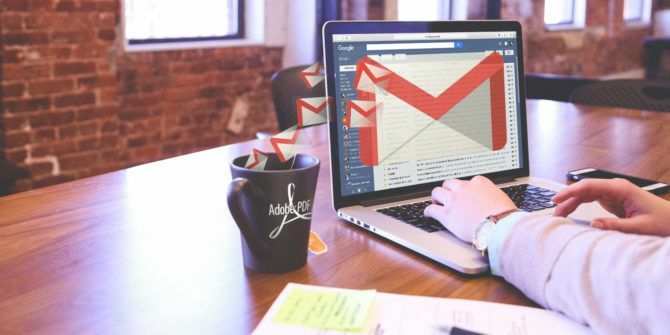 If you’re a procrastinator and have a huge backlog of messages you need to go through, this method can get you to inbox zero 4 Simple Steps to Achieving & Maintaining Inbox Zero in Gmail 4 Simple Steps to Achieving & Maintaining Inbox Zero in Gmail Read More much quicker. You can clear out your inbox, making sure you don’t miss important new messages, take your time going through the PDFs, and delete the ones you no longer need. To save Gmail messages as PDFs on Chrome download the free extension: Save Emails to PDF. After you’ve installed the extension, you will see a new button appear in your Gmail inbox that says Save emails and attachments. Click on that and you will be prompted to create a free account. You will then decide where you want to save the PDFs. You have the choice of several cloud services including Dropbox, Google Drive, OneDrive, Amazon, and Evernote. Attachments can be saved and emails can be converted to PDFs, HTML, or even plain text. You also can create specific rules that will determine how future emails are handled by the extension, meaning after you set it up, you can sit back and let it do all the hard work. Filters can be created by sender, subject, or recipient. Alternatively, you can choose to sync messages with a specific label. If you’re interested in saving individual emails rather than bulk messages, open up the message in question, and click the Save to button. A dialog box will pop up allowing you to save the message as a PDF to your computer. You can also save multiple emails to one PDF from your inbox by selecting the messages and hitting the download button. While the service is free, and you get unlimited backups, you might find that the speed of your data transfer is throttled. Do you have any tips or tricks for reaching and maintaining inbox zero? Let us know in the comments. I find it better to keep my emails than to delete them only so I can use the buzzphrase "I have inbox zero". If anything, I organize my emails by project or by year, but rarely delete anything. At least once a day I find myself searching for some info in old emails (today: looking up a quote I received 3 years ago). Besides that, emails kept on Google can be used to prove that it was sent, while saved PDFs can't (and uses more space than emails). Is this not just shifting your inbox balance to google drive, just so you can say your inbox is empty. I know that if I did this the pdfs would build up and I would never read them.